The link to the free plans is at the bottom of this page. PLEASE read the disclaimer! I do not want to end up in court because somebody took my free plans and turned them into a new type of cruise missle. This photo is a great example of why I decided to build my own backhoe attachment. 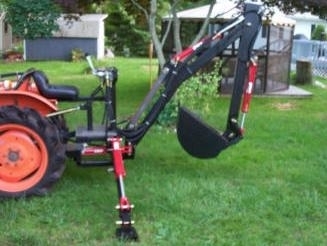 Nearly all of the backhoe attachments I could find that would fit my Ford 8N Tractor were similar to this one. Note the back-to-back seats, and how far the machine extends past the rear tires! The best price I could find for something like this was $5000 (plus shipping). Several salesmen told me it would be unsafe without the added weight and expense of a front end loader. Obviously! When you look at this picture, the weight and force of the machine is carried about 3-FEET behind the rear tires! 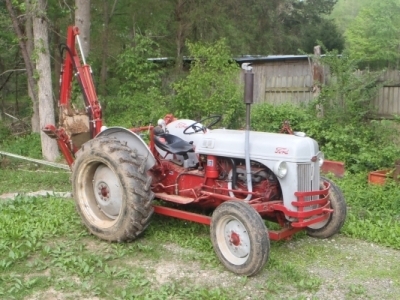 There are many 8N Ford tractors with front end loaders but the front axle is really not strong enough, the loaders are always very difficult to remove, and the added length would make my tractor much harder to maneuver on my property. The local Kubota dealer has a nice small loader/backhoe. The last time I looked, the price for the small Kubota loader/backhoe machine was around $15,000, obviously way out of my price range. 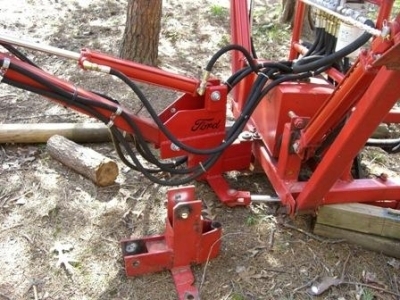 Most of the better store-bought backhoe attachments are very difficult to attach and remove. 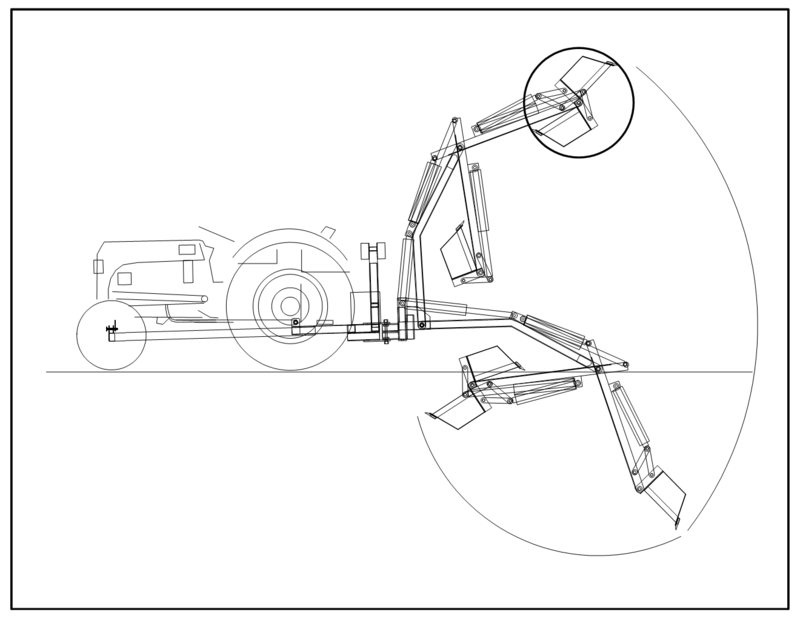 They are basically permanent attachments because you have to remove the 3-point arms and use the mounts under the differential for the backhoe. That would not work for me. 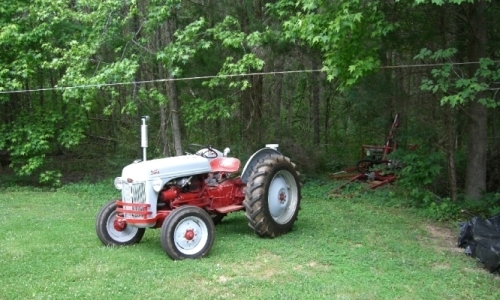 I did not want to turn my tractor into a single-purpose machine. 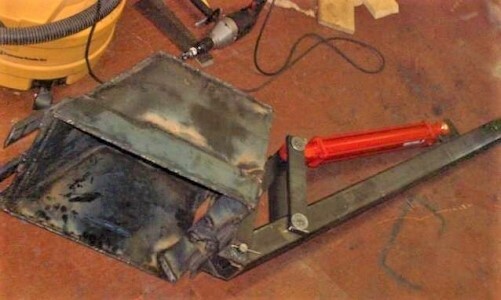 This picture shows some of the Backhoe parts when I was about half-way through fabrication and welding. It is starting to take shape. 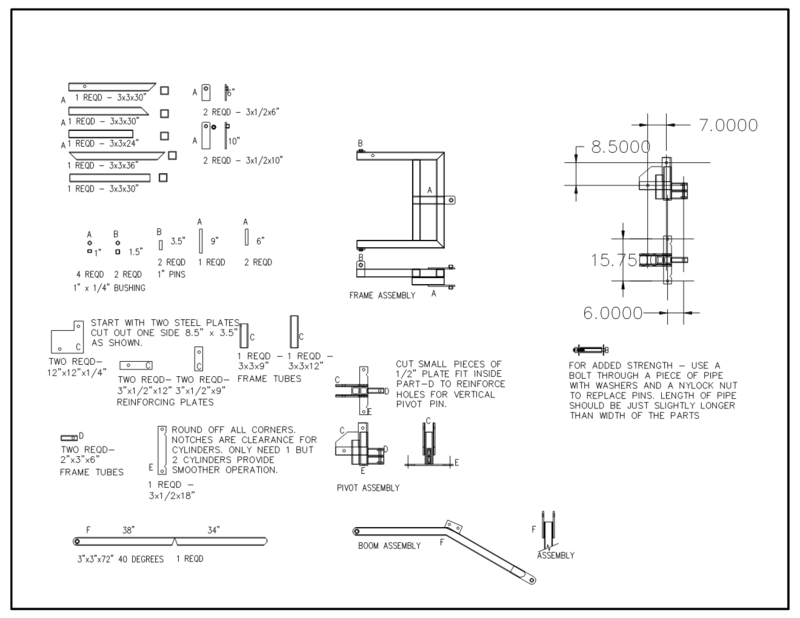 I drew the CAD plans myself from pictures of machines I found on the web. 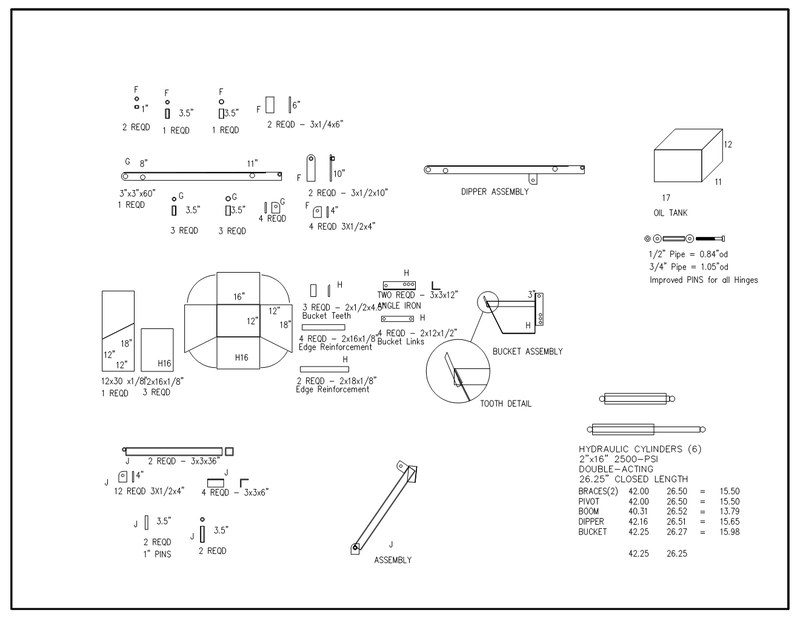 Most of the parts are 3" square or 2"x3" rectangular 1/4" thick steel tubing. The plans were mainly used to figure out how many pieces of steel tubing I would need. 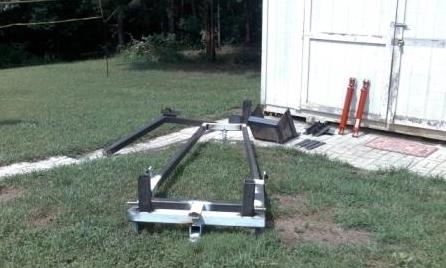 My design uses a complete sub-frame that attaches at three mounting points, two swaybar brackets under the rear axle, and a bolt through the hitch on the front bumper. Later, I moved the front mount back to a plate that bolts to the front axle carrier. The front bumper proved to be too flexible. These are still fairly standard mounting points, so this attachment will fit any N-Series Ford tractor, and many others. 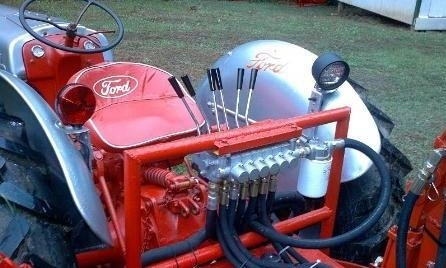 This is almost a stand-alone machine, just add a small gas engine and a seat. The 1/8" plate is plenty for the basic bucket. The cutting edges are reinforced with some 2" x 1/4" steel plate. Two scrap pieces of 3" angle went on the back to tie the bracing together and help support the pivots. Some scrap 1/16" thick filled in the gaps so dirt would stay in the bucket. Some have asked, "why build the bucket from scratch?" At the time, it was just because I could. Fast forward nine years, and I'm making a new 12" bucket. I was going to order one until I checked prices. The new bucket has a better shape than my first one and total cost will be about 1/3 the best price anyone is selling them for. The four 2" x 1/2" straps in the foreground are for the bucket pivot brackets. The way these brackets transfer motion from the cylinder to the bucket greatly increases the range of motion. Without these links the bucket would only move about 90-degrees. This was probably the hardest part of the whole project to figure out. Here is a shot of the bucket and pivot brackets mounted on the end of the dipper for a test-fitting. This was how I finalized exactly where to weld brackets and drill holes for pins. Each hinge and cylinder mounting was test-fit like this. Two of the 2" x 1/2" bucket pivot brackets mentioned previously were welded together with a hollow space in the middle to make a 2" x 1-1/8" nearly unbreakable bar that will transfer power from the cylinder to the bucket. I put a grease fitting in it so I could fill the void with grease to lubricate the pins at each end. Many small details like this were done on-the-fly and are not covered in the plans. Here is the machine mounted on the tractor for the first time. This is a good view of the original pivot piece where the main boom attaches to the frame. This is the piece I ended up redesigning. Note the come-a-long used in place of hydraulics. This is one of the early side views. 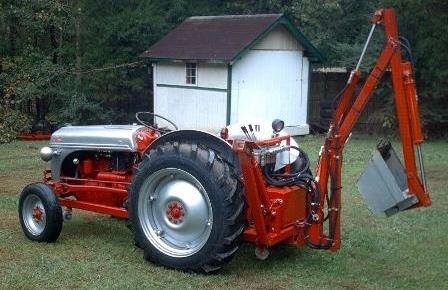 At this point I still had not figured out exactly how to attach the frame to the front of the tractor. 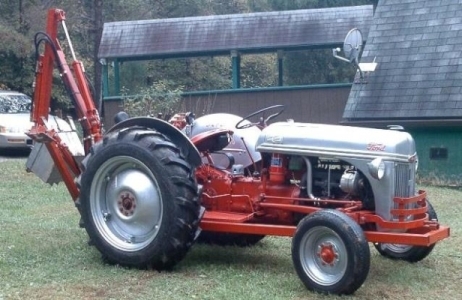 The tractor still has 15" wheels and tires on it. Yes they are 15" specials somebody made by welding 15" automobile outer rims to tractor centers. They did a nice job. In this picture, my ground clearance under the back looks great. Everything appeared to be coming together exactly according to plan at this point. 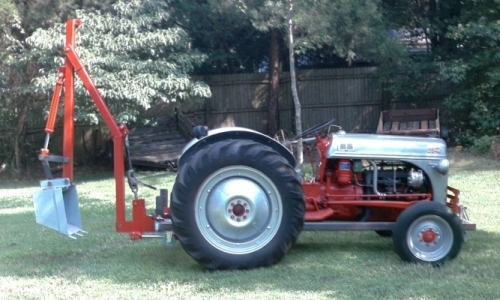 From this shot you can see how the frame sits under the tractor and attaches to the front bumper. I decided to remove the bottom rail of the front bumper. It was bent anyway, and that made it a lot easier to attach to the hitch tab on the front. That raised the front of the frame a bit. 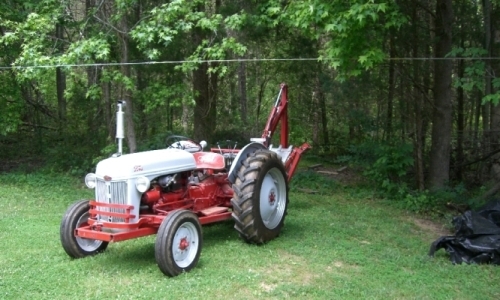 Then, when I put the original 19" wheels on it that raised the front of the tractor at least a couple of inches. After that I noticed I no longer had the generous ground clearance at the back, BUMMER! You won't find anything in the plans for the 2" pipe frame and control valve mounts. This kind of stuff was fabricated out of whatever I had on-hand and built to suit my personal preferance for operator comfort. This is non-load bearing and you can literally build yours any way you want. I almost made the tank from scratch but found a pre-fab 10-gal tank at Northern that worked perfectly. Converting the original 8N seat to swivel was simple enough, drilling the spring steel bracket for the pivot bolt was difficult. Now the same seat works facing forward or backward. Yes, the backhoe is on casters. No, it won't roll in the grass. The casters were a real asset while I was building it, but I took them off not long after this picture was taken. Six 2" x 16" cylinders provide plenty of force for my needs, but the boom and frame could probably take 3" cylinders with no trouble. I'm running the backhoe hydraulics with a Prince 11-GPM PTO pump. It works great and may be more pump than was really necessary. I have discovered that by putting the Sherman transmission in low-range and running the engine at about half-throttle it is much less noisy, and uses a lot less gas. 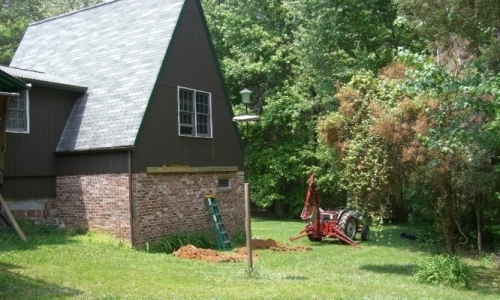 I originally intended to use the tractor hydraulic lift to raise it into position. However, after dropping and re-attaching the backhoe a couple of times, I discovered that the outriggers on the backhoe provide a much more powerful and easier way to lift the attachment into position. It is also a lot easier to insert the PTO pump if I stop short and do that before I hook up the lower lift arms. The lower lift arms help locate the attachment front-to-back until I get the backhoe frame mounted to the swaybar links under the axle. Once those pins are in place, it is easy to attach the third mounting point at the front. The backhoe attachment is a little more difficult to attach and remove than my bush hog, mostly because of the additional weight. This backhoe attachment weighs about 1000 pounds, so you have to figure it is going to be harder to deal with than most implements. But I'm really happy with the results. The worst case scenario so far is trying to attach the backhoe on a less than level area, and it still only took about 10 minutes. Sometimes I even amaze myself. I am 100% satisfied with the way this project has turned out. However, in any project like this, there are usually a few do-overs. Sometimes you have to break it to find them. Several of my 7/8" hinge pins started to bend. I straightened them on my shop press, but that was only a temporary fix. The pin-and-clip arrangement I used leaves too much slop in the joints for strength. All of the hinge pins have now been replaced with a pipe sleeve (used as a bearing). The sleeves are 1/2" and 5/8" pipe cut to length about 1/32" longer than the joint and captured in each joint with a bolt through the middle with a big fender washer on each side. The bolts fit snug in the pipe and the pipe pieces are easily replaced as they wear. UPDATE AUG 2007– Apparently even that aint good enough for every hinge point. Most are holding up great but here is a picture of my pin at the bucket. Looks like this one is going to need work. I will replace the pin/bolt, and go easy on it until I make something stronger. The mistake here is obvious now. The bearing points should be in shear. 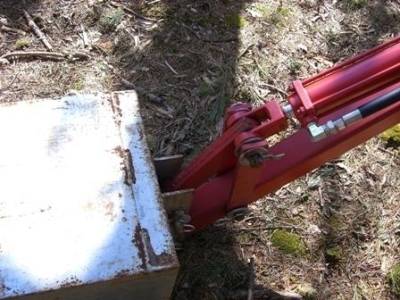 The bucket link applies force to the midpoint of the pin, so it bends. The main hinge point where the boom attaches to the frame was too weak. It worked, but was obviously under-sized. I redesigned it. The new one also gets back some of the ground clearance I lost earlier. Learned a new technique today, but broke the backhoe again. The easiest and fastest way to push dirt into a hole is to use the side of the bucket and sweep dirt sidways. I was happy until I tore the mount for the cylinder running the side-to-side motion right off the frame. This mount was a piece of 1/4" thick steel angle. It looked strong enough until the cylinder tore one flange in half like it was a piece of cheap cardboard. Oops! I did not anticipate doing any real work with the side-to-side motion. The cylinder is now mounted using a 1" pin straight through the frame rail. Running the side-to-side motion with only one cylinder works, but it is a little awkward. 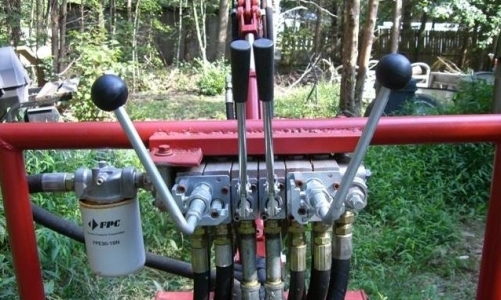 Hydraulic cylinders take more fluid and have more force when extending than retracting. This means the boom moves much faster to the left than to the right and it is hard to get used to. The difference in speed and force is mot nearly as obvious with any of the other up-down or in-out motions of the boom, dipper, and bucket. 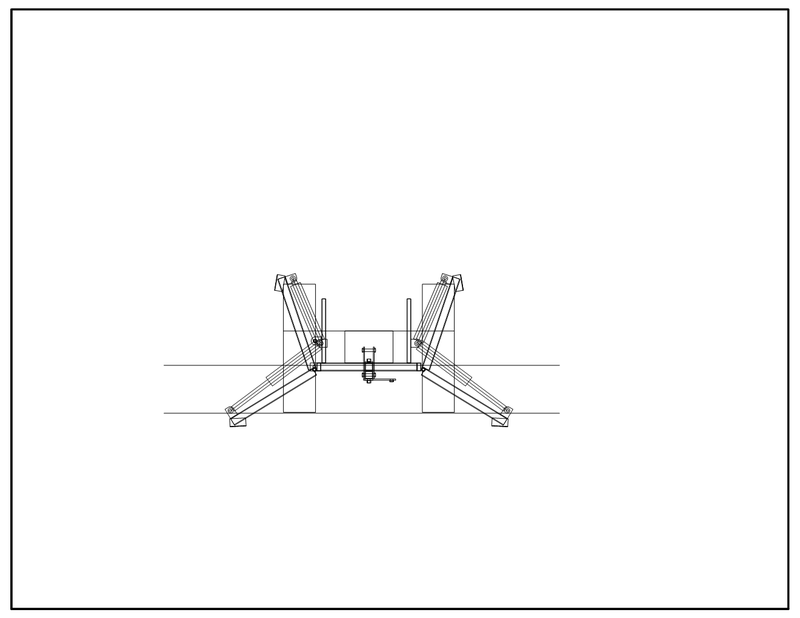 Each outrigger is attached to the frame by a hinge made with two pieces of 3" angle iron welded to the frame. It looked simple and strong. They are plenty strong enough to raise the rear tires off the ground. But not strong enough to resist the forward and backward force of digging with the backhoe. I have pulled them both loose from the frame and had to weld them back on. Here is a photo of the new main hinge piece. I set the old part next to it for comparison. The new one is much larger and stronger. How about those Ford decals! The new hinge piece restored most of the ground clearance that I lost in the back. Moving the boom hinge point higher also made it easier to pick up and carry things like stumps with the bucket and boom. Close-up of the new hinge piece. This shows the additional bracket for a second cylinder to run the left-right movement. This will be a future upgrade to smooth out the left-right movement. Update: Way in the future apparently. It's been several years and the cylinder I bought for the left side is still not installed. Close-up photo of the bucket and brackets. 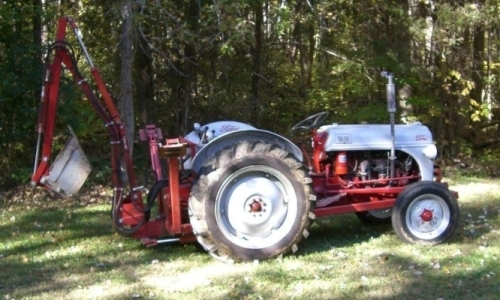 MAR 2007–Backhoe on my 52-8N tractor. 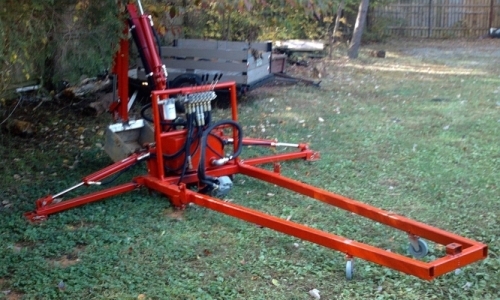 TOTAL COST–Assuming you have to by all New Steel, Hydraulic Pump, Cylinders, Hoses, Control Valves, Tank, Fittings, Hardware, Welding Rods, Primer, and Paint - Less than $3000. 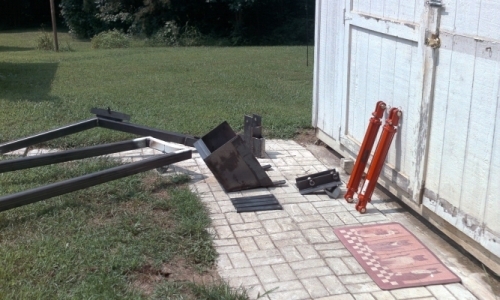 If you have access to salvage parts and scrap steel, your price will be much less. Design Time and Shop Time - About 12 Weekends, Priceless. Details of the swivel seat. Cut and welded two scrap pieces of 1/4" plate steel to extend the bracket, then drilled a hole for the bolt. The bracket is very hard steel, and difficult to drill. A big fender washer with a little grease made an excellent bearing/spacer. I planned to make a latch to lock the seat facing forward or backward, but changed my mind after using it this way. 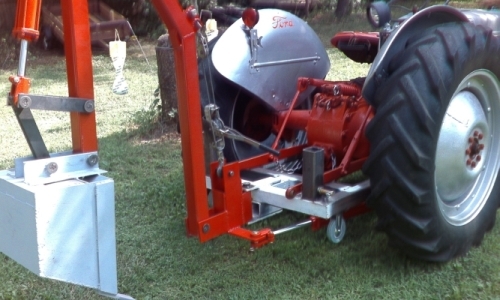 The bolt is tight enough to provide some resistance and the swivel feature makes it much easier to get on and off the tractor! I wanted these, but left them out of the original design because they were expensive and I wanted to make sure the project was successful before spending the extra money. Each joystick combines two motions in one control so it is much more intuitive and easier to operate with two hands. 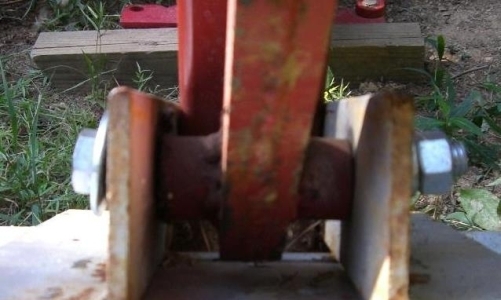 The left hand joystick controls the side-to-side and up-down motion of the main boom. The right hand joystick controls the dipper and the bucket. Moving either joystick diagonally gives you two motions at the same time. The two controls in the middle operate the outriggers. Here are some recent photos of my backhoe at work. The first photo is at 12:09 PM getting ready to go get the attachment. This photo is at 12:21 PM with the backhoe attached and ready to work. This photo is at 12:50 after digging two deck foundations 30" deep. This is exactly what I wanted to be able to do. 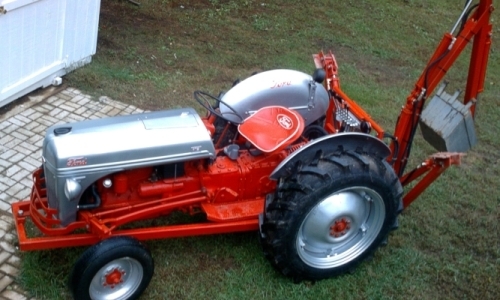 I did not want to end up with a single-purpose tractor. This implement is not incredibly difficult to attach and I was able to do this small job in less than an hour from start to finish even with time out to take pictures. The dozer blade idea (in lieu of the front frame mount) went south the second time I tried to use it. 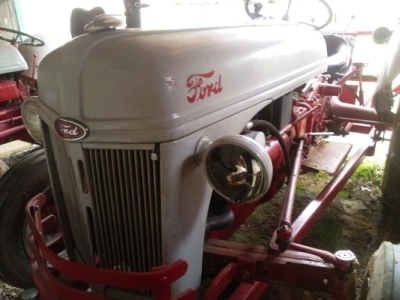 Some movements caused the frame to slam up under the tractor. Plus, with no down pressure on the lift arms, there was no way to ensure the front of the frame would stay up while traveling. I was afraid having it loose to swing was going to break something and went back to bolting the front mount to the bumper hitch. I solved the snapping outrigger problem by reinforcing them again and making my most agressive digging motion straight down rather than a front to back motion. My intent is to eventually shorten the frame and relocate the front mount to a new bracket at the engine/transmission bolting flanges. My bucket is starting to get a little loose, but that is expected, and I'm surprised the bucket has held up as well as it has. It was definitely a few grades short of "heavy duty" when I built it. Hard to find time to modify the backhoe when I need it available for small projects. Funny how you can do without something until you have one, GRIN. 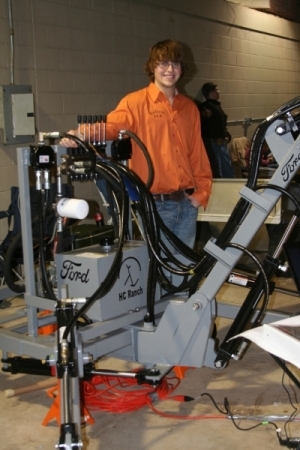 How about building a backhoe attachment for your High School Shop Project? Too late, it's already been done. In Texas of course. Ethan S did a great job and added some improvements along the way. I was born in El Paso. You could say this project has now gone back to it's roots, GRIN. The brakes have been showing less and less stopping power. 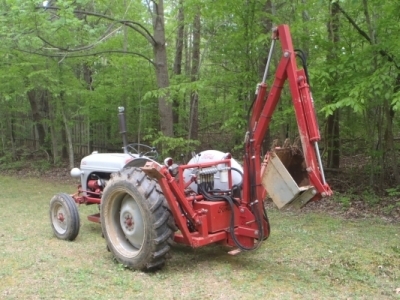 The backhoe attachment adds about a thousand pounds to the weight of the tractor. That extra weight can make a big difference on a hill. I had to let it nudge into a tree in order to stop. It was that or go tearing off down the hill. The headlight got a little crunched. I avoided having to do axle seals several years ago. Tightened the hubs, thoroughly cleaned the brakes, and it was good to go. The hubs are still tight, and the sump isn't overfilled, so this time it probably will need new seals. Hard to believe the backhoe is 9 years old! Here are some recent photos. 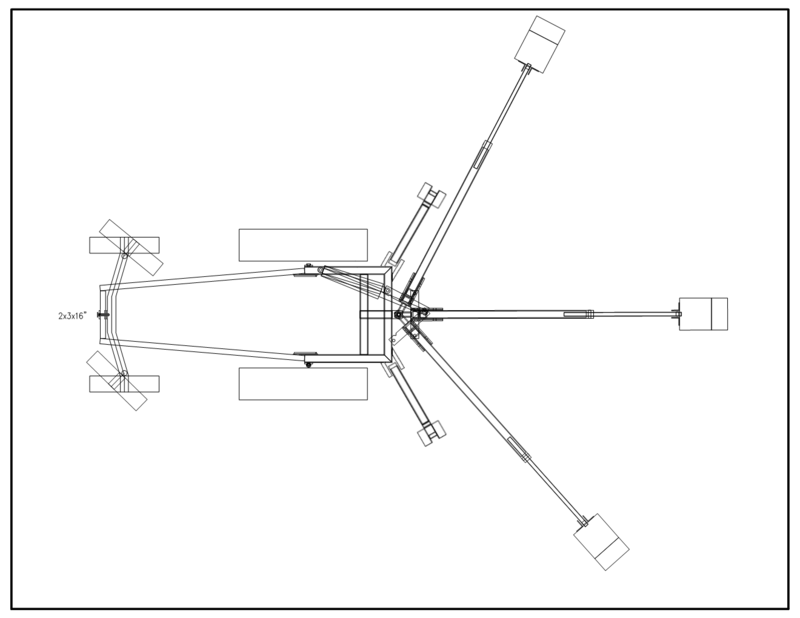 As you can see, adding the second cylinder to even out side-to-side motion is still on the to-do list. I've gotten used to the way it works, and the cylinder I bought to use there is still my spare. Some of the hoses are beginning to show signs of deterioration from being out in the weather for 9 years. 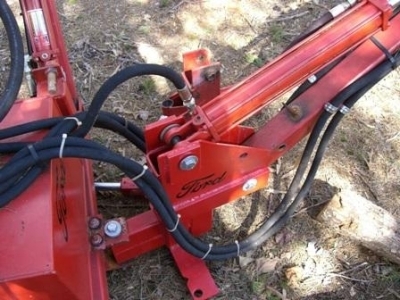 There have been several different front mounts for the backhoe frame. Almost anything is better than using the bumper hitch. This is a close-up of the best front mount I've come up with. 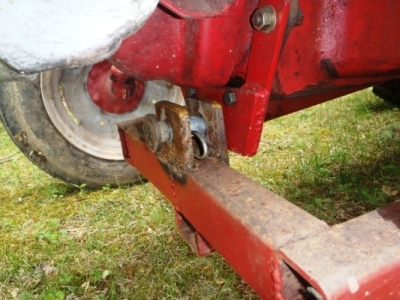 The pin slips through an anchor plate added to the front axle carrier. I used two 1/2" plates in front to keep the pin from twisting. 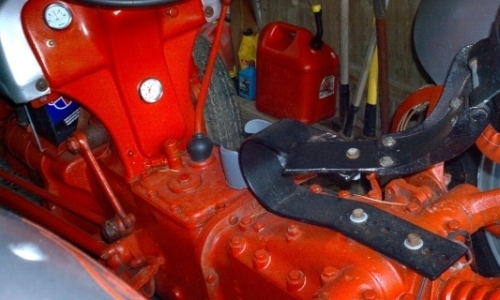 The retaining clip goes between the two front plates rather than behind the anchor plate. Only reason I put the hole for the clip in front was so I didn't have to reach or crawl under the tractor to insert the clip. 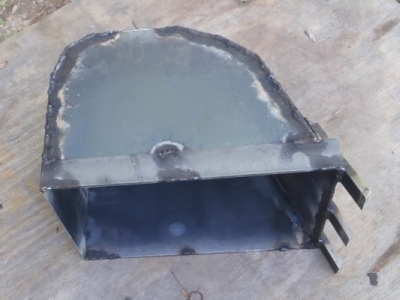 Look at your oil pan to see why I did mine this way. It would have been better to use a continuous piece of square steel tube for the sub frame on each side. I switched from 3" square to 2" x 3" tube within a few inches of the axle support point. After flexing for a few years, it finally snapped at the weld. Here's my new 12" bucket. I was going to buy a bucket until I saw some prices. This one will have cost about $150 when finished. 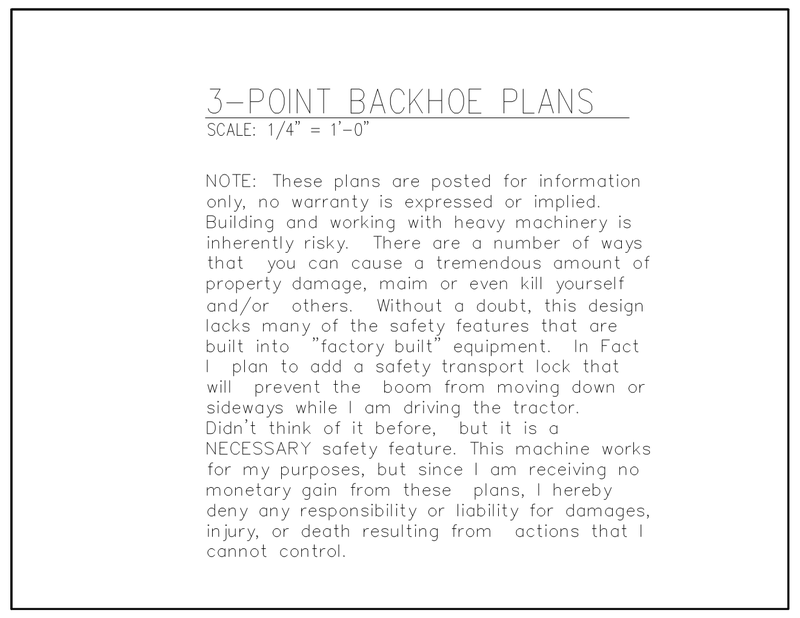 The plans for this backhoe have been redrawn to fit on the smaller image files below instead of one large drawing. Too many people were having trouble printing a legible copy of the large drawing. I made a few modifications as I put the backhoe together, most of the changes have been added to these newer drawings. The primary purpose of these plans was to work out sizes of the major components and get a better idea how much steel I would need to buy. Items that are not dimensioned were cut to fit on the tractor. Mounting points for the cylinders were determined after assembly of the major components. I did it this way to make sure I had more travel in the joint than in the cylinder. The cylinder must run out of travel before the moving parts do. If not, the cylinder will be trying to pull or push the machine apart. I also wanted all of my cylinders be identical. That way I would only have to buy one spare to replace any cylinder that might get damaged. Here are the drawings I created and used to build my backhoe. These have been updated with new information for all the pieces I broke and re-designed so you will already have the benefit of my initial prototype testing (breakage). This is freely distributed information without any guarantee of any kind. By saving and printing these images you are agreeing to not hold me responsible for any problems, damages, injury or death that may occur from the actual use of this information. If you do choose to tackle a project like this, be very careful! Make sure your welds are good and strong! These are very heavy parts, and the machine will generate a lot of force that could easily bruise, crush, sprain, squash, mangle, traumatize, cut, rip, tear, amputate, kill, etc. I'm not joking! This is meant to discourage anyone who has not previously attempted similar projects. Small Quantities Specialist - Metal Sheet, plate, pipe, and structural shapes delivered to your door!